Krishna asks Chandravali where did she gain her vast knowledge from. Chandravali says from a saint by serving him. He says let us have lunch. Kirtida says Chandravali is an excellent poet. Krishna insists her to recite her poem and says even Balram Dau wants to hear her poem. Chandravali starts poem. Radha completes it with a joke. Krishna says some people don’t have cannot understand poem, so let us discuss while having food. Balram takes him aside and asks why he is troubling Radha, she is very angry. Krishna says Radha is troubled by jealousy. Balram asks how will he free Radha from jealousy. Krishna says he will not reveal this time as Balram always reveals their plan to others. Radha checks food utensils and asks Kirtida why did not she prepare her favorite dishes.. Kirtida says when guest arrives, we should prepare guest’s favorite food. 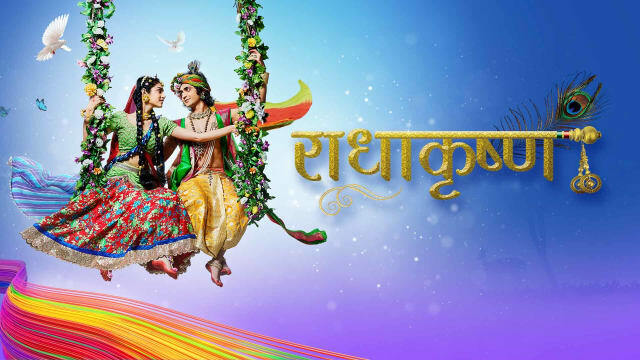 Krishna with Balram returns. Radha serves them all food. Krishna enjoys food praising that Chandravali’s food choice is very good. Once finished, he offers Chandravali to show her Vrindavan. She agrees. Radha says let her finish food. Krishna says she should also have sat with them and walks away with Chandravali. Ayan sees Krishna’s friends playing and asks where is Krishna. Krishna passes by with Chandravali. Ayan greets her. Krishna says Ayan is Radha’s old friend, so he knows Radha’s cousin Chandravali. He takes Chandravali from there. Ayan is amused seeing Krishna’s attention towards Chandravali. Balram taunts Ayan if he is amused seeing Krishna with Chandravali instead of Radha, he knows what he means. Ayan stands fuming and follows Chandravali and Krishna. Krishna gives moral gyaan that one must be knowing people whom they consider selfish as they are not seen for years and come to them only when help is needed, they get angry and think of not helping them, but they should always help people as people seek help only from competent people and one should be thankful that god made them competent. Precap: Vishaka takes Radha to show Krishna dancing with Chandravali and Gopis. Radha thinks how could she not hear bansuri sound and how can Krishna dance without her.